Wisconsin, Ohio, Texas, and North Carolina won’t stop suppressing the vote. On July 29, US District Judge James Peterson called Wisconsin’s process for issuing voter IDs “unconstitutional,” “a wretched failure,” and “pretty much a disaster.” The state’s strict voter-ID law “has disenfranchised a number of citizens who are unquestionably qualified to vote, and these disenfranchised citizens are overwhelmingly African American and Latino,” he wrote. Reporting in The Nation and the Milwaukee Journal-Sentinel, based on DMV recordings provided by VoteRiders, confirmed that across the state Wisconsin was systematically failing to promptly issue IDs for voting as required by the court order. In response, Peterson ordered an investigation and held a hearing on October 12 and 13. In his written opinion, Peterson said that “defendants have not complied with the court’s order” and “have done little to inform the general public that credentials valid for voting will be issued.” The judge ordered the state to immediately provide clearer information to voters about the law and promptly issue IDs for voting to anyone who needs one, but said “the court does not believe that it has the authority to suspend Wisconsin’s voter-ID law for the November election.” That means that, despite the well-documented problems, one of the country’s worst voter-ID laws will be in effect for November, and the very state agencies that have been non-compliant with federal-court orders will be relied upon to implement it. Early voting is already underway in Wisconsin, and people are being disenfranchised. I wrote four stories in the last two weeks about longtime voters who could not vote because of the voter-ID law. Zack Moore, a 34-year-old African-American man from Illinois who brought an Illinois driver’s license, Social Security card, and proof of Wisconsin residency to the DMV, but was not given a Wisconsin voter ID. Claudell Boyd, a 62-year-old African-American man from Illinois who made 2 trips to the DMV, but was not issued a valid voter ID because one letter was misspelled on his birth certificate. Christine Krucki, a 90-year-old white woman who’s been voting since 1948 and made three trips to the DMV, bringing an Illinois photo ID, proof of residence in Wisconsin, a birth certificate, and her marriage certificate, but could not get a Wisconsin voter ID. Sarada Hanumadass, a 42-year-old Indian-American woman who’s been a naturalized US citizen since 8 but was told she’d need to pay $345 for her naturalization papers, which could take up to two years, to get a Wisconsin voter ID. 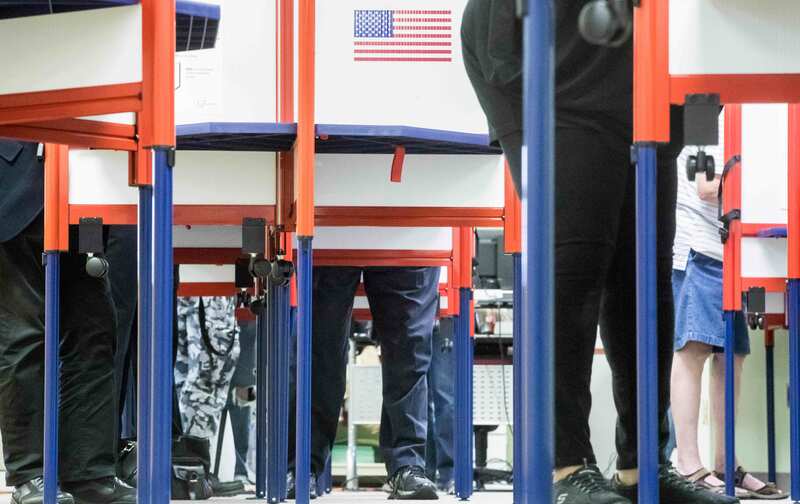 In Madison, the clerk attempted to call hundreds of voters who failed to send in identification, yet 355 who were contacted still failed to get in proper identification. In Milwaukee the situation was worse. The Milwaukee clerk estimated that 150 voters who sent in ballot applications indicated they did not have the required ID at all, an estimated 1-2 percent. Wisconsin is not the only GOP-controlled state where Republicans are ignoring court orders to restore voting rights. Ohio has purged more than 2 million voters since 2011, more than any other state, and refused to mail absentee ballots to 1 million registered voters. A federal court struck down the state’s voter purge in late September and ordered the voters to be put back onto the rolls. But Ohio is now refusing to reinstate many of the purged voters before the election, according to Think Progress. “This is shameless behavior that endangers our democratic process,” says State Representative Kathleen Clyde. In Texas, a federal court ordered the state to relax its voter-ID law and allow those without strict forms of photo ID to cast a ballot. But even after the court order, the state has issued misleading information for voters and is now threatening to prosecute voters who sign an affidavit instead of showing photo ID. In North Carolina, after a federal court restored a week of early voting, the North Carolina Republican Party called on GOP-controlled county boards of elections to further cut early-voting hours and days. “Republicans can and should make party line changes to early voting,” wrote executive director Dallas Woodhouse, which included adopting fewer early-voting days and prohibiting Sunday voting, when black churches hold “Souls to the Polls” mobilization drives, and polling places on college campuses. The state board of election rejected many of these cuts, but five major counties in the state have reduced early voting. It’s long past time for these states to comply with the Constitution and the law.